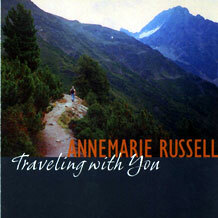 Traveling with You is singer/songwriter Annemarie Russell's second album, recorded at Jack Straw Studios in Seattle, Washington. Engineered by Doug Haire, this CD showcases Annemarie's thoughtful songwriting with the lovely melodies of acoustic instruments and vocal harmonies. While Traveling with You carries the same acoustic feel as Russell's first album, the songs on the CD have themes revolving around issues of social justice, compassion, and questions asked of Western culture. As a critic of culture, and a person of faith, Russell is not afraid to ask the hard questions that echo without answers. This album certainly reveals a mature songwriter challenging the cultural norms of society. The addition of bassist Ken Lysen, pianist Ben Brody, mandolin player Steve Tapia, recorder player Sonja Naylor, and the guitar and vocals of Douglas Haub and Seattle singer-songwriter Shannon Beck give the album an organic yet cohesive sound. As a completed work, the album gives voice to Russell's concern for the world around her juxtaposed with her lovely sense of melody and language.